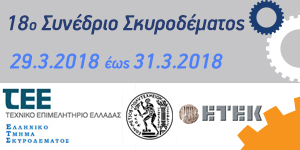 The Hellenic Department for Concrete of the Technical Chamber of Greece with the National Technical University of Athens in cooperation with the Cyprus Scientific and Technical Chamber (ETEK) are organizing a Conference on Concrete on March 29-31, 2018 at the Eugenides Foundation in Athens. The Conference is anticipated to accelerate the re-launching of the Construction Industry. 40 years ago, the Hellenic Department for Concrete of the Technical Chamber of Greece established the Conference on Concrete, which mainly aims at the Technical, Construction and Contracting Sector, to the Higher Education Institutes as well as to all Public Bodies and Organizations related to concrete technology. The closing date for submitting abstracts for the 18th Conference on Concrete is on September 25, 2017.